OS X Server is Apple's implementation of a server environment especially tuned to run on Macintosh computers. These days, OS X Server exists as a $19 download from the Mac App Store. It turns any Mac running Mavericks into a server capable of supporting workgroups and businesses large and small. OS X Server incorporates file sharing capabilities, profile manager support to help with the unified management of Macs and iOS devices, a caching server to enable administrators to collect and distribute Mac and iOS software updates, Xcode Server for developers, unified Time Machine backup, a Wiki server, services for shared calendar, contacts and mail, and Xsan 3, Apple's implementation of a Storage Area Network system, an advanced file sharing system. There's much more, too — Messages server, NetInstall support, and VPN Server. All this for a ridiculously low price: $19.99. It's largely a trivia point, but OS X Server actually predates the release of the client version of OS X. The first version of Mac OS X Server was released in March of 1999, more than a year before Apple would release a public beta of OS X for everyone else. That first release was a very different server than we know today. A melange of NeXT's OpenStep operating system and Mac OS 8, it provided the ability to share files, manage QuickTime streaming services, run Apple's WebObjects application server software and more. Eventually Apple would release OS X Server in lockstep with the client release of OS X, offering up the software for enterprise IT managers and others. Apple steadily increased the capabilities of the software with web publishing, migration software to make switching from Windows servers easier, e-mail server support, proxy/cache service to make managing Mac (and eventually iOS) downloads easier, and much more. For a long time Apple sold the software for $999 with an unlimited user license, or $499 for a 10-user license. Apple eventually halved the unlimited user price to $499 and dropped the 10-user tier all together. Then with the release of OS X Lion 10.7 in 2011, Apple took a radically different path. OS X and OS X Server were no longer two distinct operating systems — there was just Mac OS X. Lion Server existed as a $49 download from the Mac App Store, and this represented another huge drop in price: administrators would be out a scant $99 for an unlimited user license. Today OS X Server remains available as a download from the Mac App Store, but the price has been further reduced to $19.99. The software is squarely aimed at small businesses, schools and enterprise workgroups. Apple also offers a specially configured Mac mini with OS X Server preinstalled (with double the hard disk space), for $999. Cozy, Coozy, Coozie, Koozie. However you spell it and say it, Lory has the market cornered! macOS Server 5.4 changes in High Sierra you need to know about! Thinking of upgrading your macOS Server to High Sierra? Here are some change that may affect you! Here’s our wish list for macOS Server High Sierra! How do you set up , administer, share files, speed up iCloud access, create a VPN server and create a messaging server on macOS Server? With our ultimate guide that's how! Have a Mac connected to your home theater projector? Need to improve the display visuals? Here’s how! How to create your own private messages service with macOS Server! Need a secure and private messaging service within your organization? The macOS messages service can help! Want a VPN but don't want to trust a third-party service? Roll your own with macOS Server! How can I more quickly download and install apps and updates on all of my Apple devices? How to set up file sharing on macOS Server! Do you like the idea of saving files in the cloud but want the privacy or running your own file server? Apple’s macOS Server makes it easy to save, share, and access files! 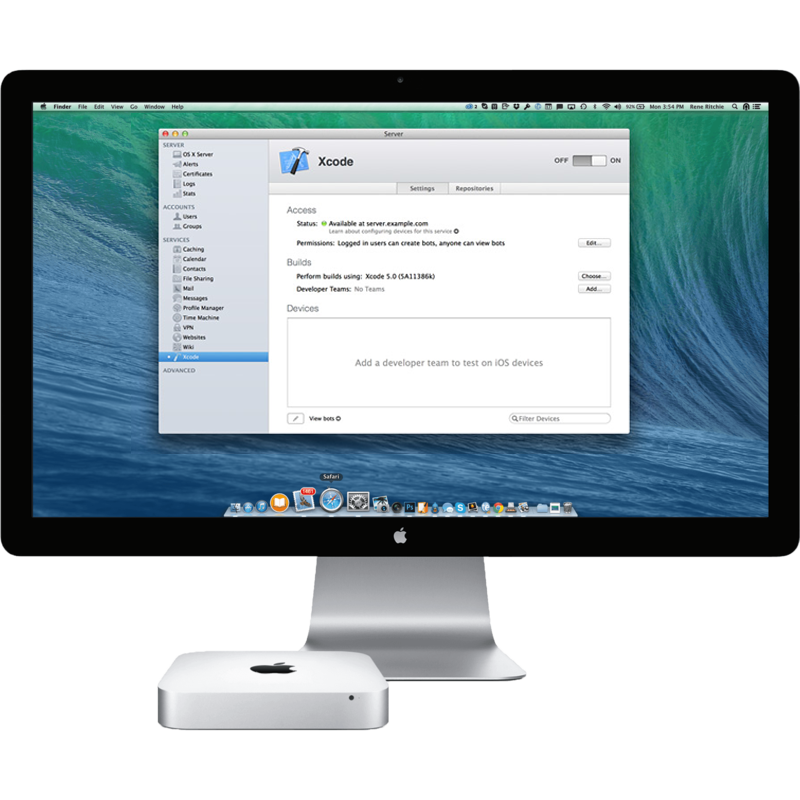 How to administer all of your Macs from a single device using macOS Server! Do you have multiple Macs on your network with different services that you’d prefer to manage from a single computer? You can administer all of your Macs from a single device using macOS Server! Apple had posted a copy of the OS X Server 4.0 Developer Preview that will work on OS X Yosemite to the developer center for download. The OS X Server 4.0 software, considered beta, comes just after Apple had released a second gold master of the OS X Yosemite beta for developers earlier this week. You can grab the download from Apple's developer portal. Well if it's anything like the license key for Winderz, you may be out of luck.